Broadband has become a necessity in today’s fast moving world. Having a good and strong broadband connection has become the need of the hour because every third person at the present is highly dependent on the internet to complete their daily and important tasks. Be it downloading or uploading files, listening or watching songs and videos, playing online games, enjoying live streaming videos, mailing or chatting, without a good connection to enjoy all these things in today’s time is highly difficult. In last few years, the broadband market has grown to great extend that’s why a large number of Internet Service Providers (ISPs) are available in the market nowadays. Despite having good number of ISPs in the area, many users are still not getting high speed connection to enjoy hassle free web access. Speed and good connectivity are the two major concerns for many users. Today there are many big players (ISPs) available in the market claiming to offer better speed at best data package plans. As their names are big and quite popular, many users don’t bother to find out the real worth of their services. During the peak hours, many of these names fail to provide good speed. Even during extreme weather conditions, their connection usually gets affected and users start facing issue of connection error. Here, users should find out whether their ISP is worthy enough. Once you start finding out the real worth of your ISP, you will be surprised by many unknown things. Users should understand that their connection line is usually shared with some other users as well (it is known as connection ratio). Many service providers run many connections on single line which caused slow connection and connectivity issue. The ideal connection ratio is 20:1 but many service providers have 50:1 connection ratio. It means a single connection or channel is used by 20 to 50 users. So when you have fewer users on a single line, it offers faster speed. Be it a connection for home, office or any business, users should look for 4G - Good Bandwidth, Good Connection Ratio, Good Connectivity and Good Speed. Today when competition is tough, it is really very hard to create a place in the market. 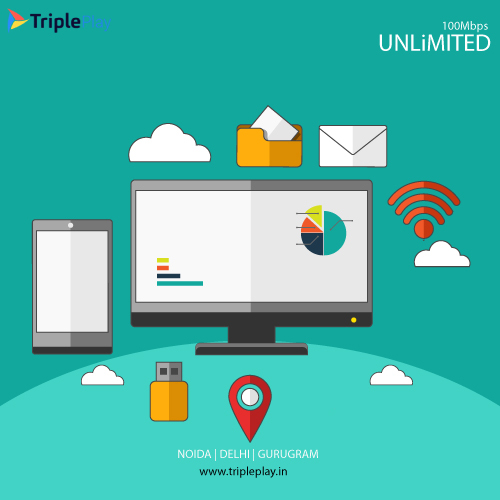 But despite facing all the challenges, TriplePlay Broadband has created a special place in the heart of its users and that too in short span of time. In various parts of North India, TriplePlay is better known for its efficacy, performance and excellent customer support. If you live in Gurgaon or Delhi, you can take a feedback of many users about the services of TriplePlay. Most of them will surely consider it as one of the best broadband service provider in Gurgaon and the most reliable internet connection in Delhi. The aim of TriplePlay is to provide good connection to every household and business therefore you can find its data packages are quite affordable. So enjoy best connection at best price and explore web connection like never before!